This entry might better be called "The devil's in the details". Load control - The 10P as shipped has fixed link coupling to the antenna. This is fine if your antenna happens to match to load needed by the 10P 6L6. Even the 10P manual mentions adjusting the load between CW and AM. The solution is to add a variable cap between one side of the output link and ground connecting your feedline between the other side of the output link and ground. I've done this before. See my TZ-20 Amp Output Circuit entry dated Feb 4, 2012. Transmitting Crystal Adapter - In 1940 crystals were still expensive. Hams typically didn't have several to choose from. They didn't move around the bands. Putting a crystals socket on the front panel was not a priority. Burying the crystal socket inside the transmitter, accessible only from the back, was good enough. I, on the other hand, have several crystals on both 40 and 80. I want to easily change frequency. I also have a two holder types, each with different pin sizes and spacing. The solution is an adapter that plugs into the 10P crystal socket and sits on top of the 10P. See Function Again Wins dated May 28, 2014. The cute solution works fine in the 10P and includes a bulb to give an indication of crystal current. Key Isolation - Cathode keying was common the simple rigs. With cathode keying comes high voltage across the key terminals. The 10P is no exception. 100V appears across the key terminals when the key is open. Definitely a case of keep your fingers out of where they don't belong. See Cathode Keying Safety dated April 23, 2018. I use a Keyall HV interface to keep high voltage off of the key terminals. I've already mentioned the need to step down modern house current to match 1940 designs. See information about this at Stancor 10P Transmitter - Part 3 dated July 20, 2018. The Heathkit SWR meter helps with tune up. Both the 10P tank tuning and external loading need to be adjusted to maximize power out and efficiency as indicated by the SWR meter forward power and plate current meter. Finally, the operating position includes a TR switch. In my case this is a simple SPDT toggle switch switching the antenna between the 10P and my NC-57. I've continued to make progress on my 10P. All of my initial "to dos" are done and my new transmitter is coming to life. It puts out a good 10 watts on both 80 and 40 with just enough chirp to give it personality .... but (always watch out for the buts) ... my 10P is running a little too hot. Voltages are all significantly high, even filament and B+ straight out of the power supply. The easiest issue to address is the high filament voltage. I measured it to be about 10% high. This makes sense. In 1940 house current was lower than today, about 110 V vs 120-125 V today. A power transformer designed to generate 6.3 V in 1940 wold now show closer to 7 V, about what I measured. To solve this I have step down transformers at both of my prewar operating positions. I decided to add a third. I started with a 12V at 8A filament transformer that I had on the shelf and rewired it with the primary and secondary windings in series. With the windings properly polarized 120V across both windings generates 108 V at the junction of the two windings. It becomes an auto-transformer with one tap. Since only the old 12 V winding sees full current, the 8 A rating now is the auto-transformer rating, about 900 watts. Electrically this auto-transformer sits between the 120 V wall outlet and the 10P. The 900 W power rating will allow me to plug my receiver, probably a NC-81X, into it also. As expected the 10P filament voltage dropped to 6.3 V but B+ still remains high. This may be because the replacement electrolytics I used in the power supply are larger than the originals. I'll need to work on this. Addendum - The high B+ was a simple fix (but I'm not a fan of the engineering trade off behind it). 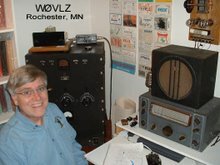 I had removed the 6L6 modulator while testing CW. It turns out that this tube loads down the power supply, even in CW mode. I plugged the 6L6 modulator in and B+ now looks about right.